Jacek A. Rochacki is a member of the Polish Pismo Owner's Club in Warsaw. Years ago, when I was using happily my Mac SE with two FDD 800 KB drives and an external SCSI 80 MB hard drive, life had changed in a good direction. I was nominated to became a visiting teacher in a certain Western European country, which involved taking up to six trips abroad per year, and it was a great help to have my computer with me as one of the instruments for playing the clever man. The nature of my educational service required having about 100 kg of instruments, rare printed materials and books, and plenty of tools, so air travel was out of the question. My first Toyota provided me with very reliable service; my books and tools were ready for transportation. The remaining question was the computer system, especially the external hard drive, which didn't make the Mac SE an easy thing to transport. 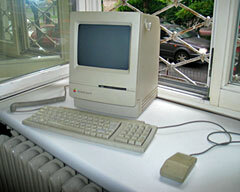 The author's Mac Classic II. The PowerBook 100 was then far too expensive for me, so I went for a second-hand Mac Classic II, mostly due to it's internal hard drive. I still keep this machine in perfect working condition, and it nicely amazes the children and grandchildren of my friends. The question of transportation for the Classic II boiled down to designing and making a proper bag; such bags were available in USA, but I had no time to get my US residing friends involved. The designing was very simple, as the cuboid form of the computer determined the shape of the bag. In order to do the job properly, I began by obtaining the best materials (in my opinion). 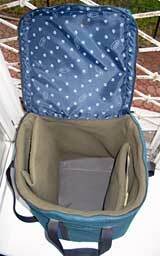 I used rugged Cordura® for the outer shell, which I got from my colleague, who was then running small company specializing in making rucksacks. 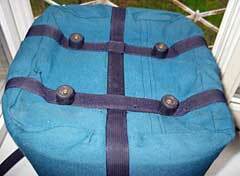 I sewed the inner lining of fleece, like the one used for outdoor activities garments, and stiffened the sides with pieces of carrimate, cut accordingly to the desired shape and fixed invisibly between the outer and inner lining of this bag. In this way I also made side compartments for the keyboard and some other gear. I took special care with the bottom of my bag. In order to make it stiff and solid enough, I cut a piece from 1 cm. thick Kevlar plate, and used it as a sort of foundation in the bottom. Then I fixed with solid screws four rubber elements, which were simple rubber stoppers that were those days used in home interiors for preventing doors from contacting walls. And here is my first mobile computer in this bag, ready for the road. When in due time St. Peter calls me to His gates, if I were given a choice which machine to take with me to continue writing, I would be in difficult situation. I respect the speed and power of my Little Al PowerBook, I admire the close to perfectness quality of Pismo, and I enjoy the ruggedness of my Wallstreet II. 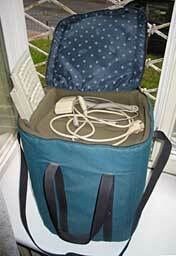 But I can not exclude, that I would then pack once more my Mac Classic II into its carrying bag . . . it has been so good on long journeys.